But London’s spirits are not so easily dampened by ash or snow (but they all groaned when their bid for FIFA World Cup 2018 lost to Russia’s). 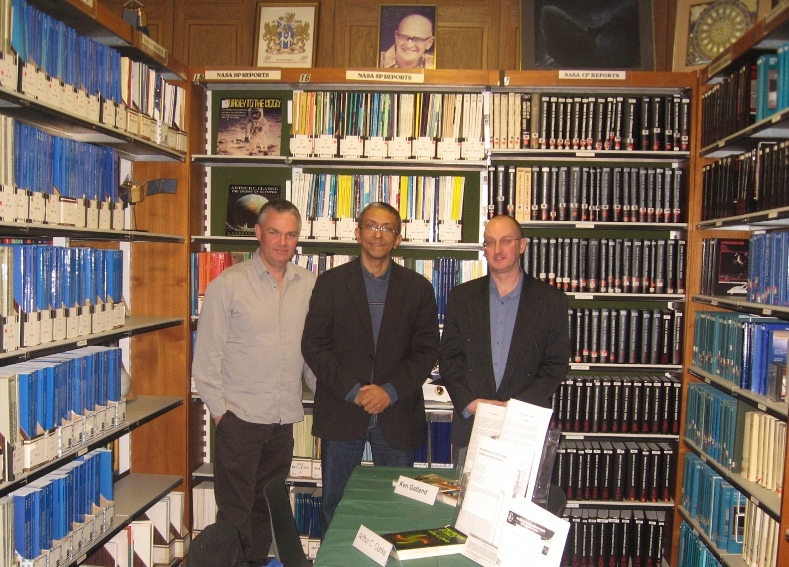 A highlight of my week’s stay was a visit to the British Interplanetary Society (BIS) headquarters on South Lambeth Road. BIS, founded in 1933 by Phil E Cleator, is the oldest organisation in the world whose aim is exclusively to support and promote astronautics and space exploration. It was originally set up not only to promote and raise the public profile of astronautics, but also to undertake practical experiments in rocketry. 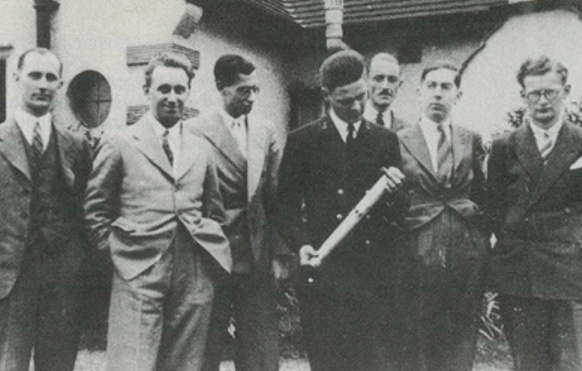 But the pioneering British ‘space cadets’ soon discovered that Britain’s the Explosives Act of 1875 prevented any private testing of liquid-fuel rockets. Undaunted, they continued with their thought experiments, discussions and public advocacy. Perhaps it was just as well that they didn’t get into the messy (and potentially hazardous) business of rocketry. For over 75 years, they have been preparing humanity’s engagement with the realm and challenges of space. Unlike its American and German counterparts, the BIS never became absorbed into the rocket or space industries that developed after the Space Age began in 1957. I have always admired the BIS for their pioneering role in popularising space travel, and having ha the audacity to dream of it and in public too. So I was delighted to be invited to the BIS annual Christmas get-together on the evening of December 1. This year, they celebrated the life and times of their founder member and two-time chairman, Arthur C Clarke. Mark Stewart, the energetic librarian and archivist at BIS, heard I was visiting London and invited me to join their members-only event. 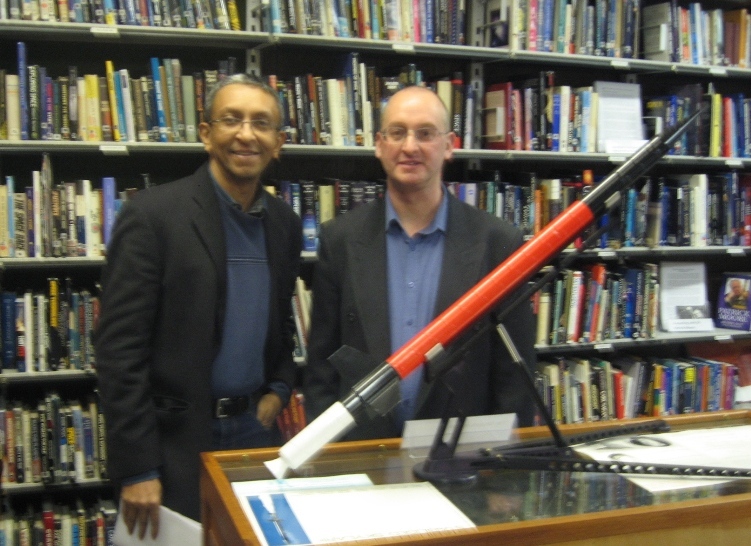 Mark is currently looking after one of the finest collections on astronautics on this side of the Atlantic. Some records and documents at the BIS Library go back to the 1930s. It was good to finally visit ‘ground zero’ of where it all began — nothing less than humanity’s long (and eventual) journey to the stars, hatched by a group of starry-eyed youth as an entirely private, citizen initiative. It took another 20 years — and considerable battering of London by Germany’s V2 rockets — for the British government to take it seriously. I spent the afternoon chatting with Mark and Colin Philip, a BIS Fellow. Joining us later was Mark’s teenage son Alex, a next-gen space cadet already volunteering at the society. They gave me the guided tour — only a few months ago, I heard, a certain N. Armstrong had been similarly shown around. The society is certainly proud of its history and Sir Arthur’s photos, books, papers and posters are prominently displayed. I was familiar with much of the ground that Mat covered, but there were occasional revelations. For example, I didn’t know that circa 1995, Mat and (Sir Arthur’s brother) Fred Clarke had worked with the Isle of Man Post Office to issue some stamps bearing Sir Arthur’s visage and other iconic images associated with him, e.g. the monolith from 2001, comsats, etc. Alas, the plans didn’t work out, but Mat still has the designs and is hopeful that the British Post Office might consider it for the author’s birth centenary in 2017. Of course, some lobbying will be needed…but there’s plenty of time for that. Like all non-profits these days, the BIS is struggling financially. It also faces the challenge of recruiting younger members – the average age of the Christmas gathering seemed to be 55 or 60. They have fascinating stories to tell (among them: the inside story how Apollo 13 was saved), but forward transmission requires more new blood. The Council, I heard, is working on repositioning the society for the Facebook generation, and I wish them every success. ‘Imagination to reality’ is their motto, and they have seen a good deal of day-dreaming of the pioneering space cadets come true. Thanks for this post. I am a UK based amateur astronomer and blogger/podcaster – http://www.astrotalkuk.org. As part of my research for a Yuri Gagarin project, it is the 50th anniversary this year; I too am planning a visit to the BIS. That is how I found your blog and this interesting post. I take it you have now left the cold/windy/wet UK? I’ve just found your website. What a treasure! Thank you for those wonderful photos. I am a member of the BIS and live in America. I’m a writer, occupied at the moment with a YA/SciFi story and one scene involves a visit to the BIS library. Can you tell me, please, which floor the library is on, and how do you reach it? Many thanks for whatever info you can give me. Many thanks for your comment and kind words about my blog! I’ve taken the liberty of sharing your comment with Mark Stewart, the honorary Librarian and Archivist of the BIS. He says he’ll be very happy to answer any more questions. « Connecting researchers and the media: Easy as A, B and C?